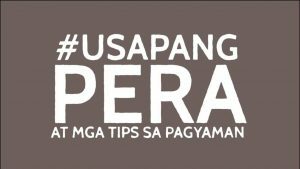 Usapang Pera Season 2 delves into the life of Sinon Loresca, a person who experienced extreme poverty and discrimination. With hard work and luck, Sinon, reached his childhood dream of being an actor. She shares his journey from a scavenger in Payatas and OFW in London to the internet sensation and “Catwalk King” that he is right now. The episodes show Sir Vince discussing with Sinon about how he can maximize his earnings and how this will not go to waste. The season also features beauty queen Nicole Cordoves, who brings with her the challenges of millenials as she strives to be financially independent. To help her with this, Sir Vince gives Nicole advice on how to make a financial plan, start investing and starting a business. They also explain the oftentimes neglected government-mandated benefits as foundation for good money management.